While you have seen many different experiments with the oil paints, terrain, etc., over the last several months... there is one other area where I have been trying out some new things! 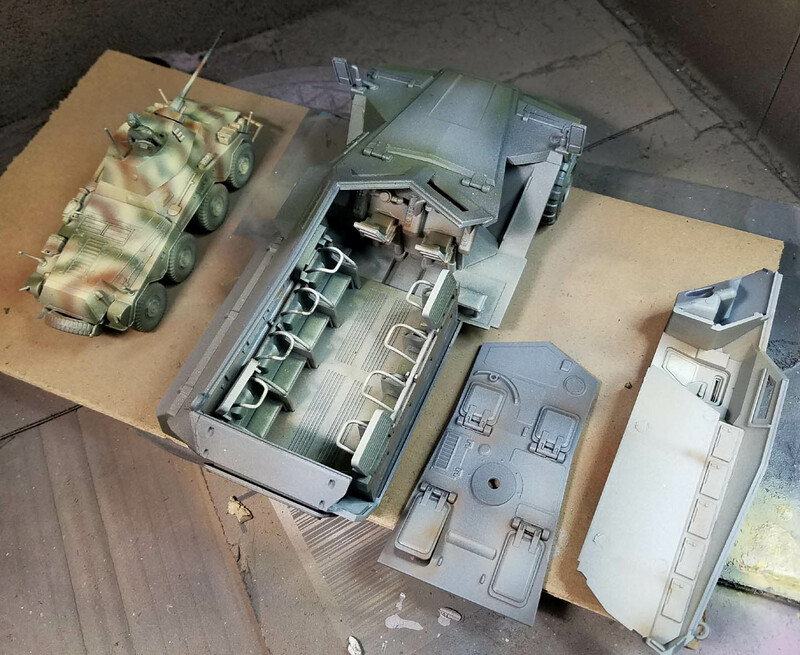 Until recently, the airbrush was used as a tool strictly for "Primer Painting", working on terrain, and so on. It was really just a way to do mass prepping for working with my regular brushes. 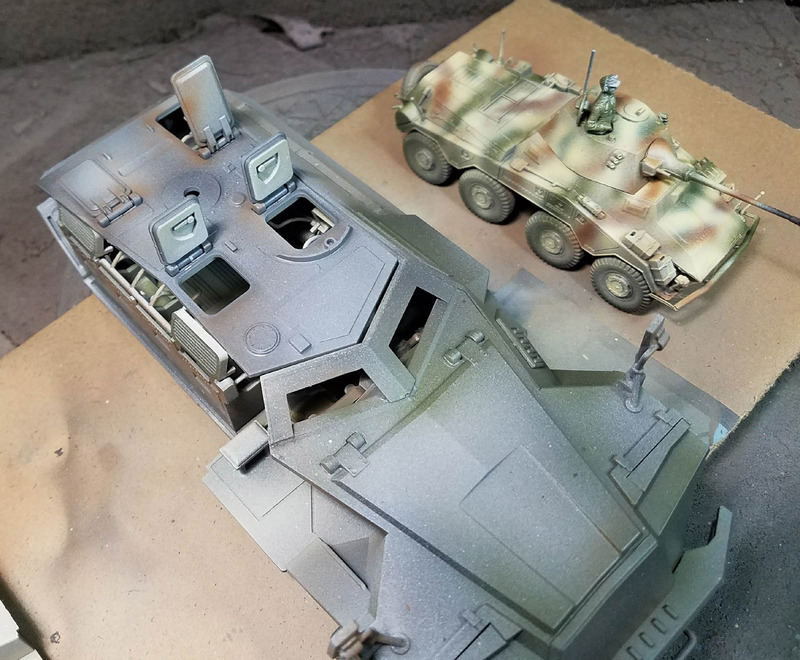 Not only did several projects demand a slightly different approach, but my curiosity was also nagging at me as I pondered other uses for the airbrush. 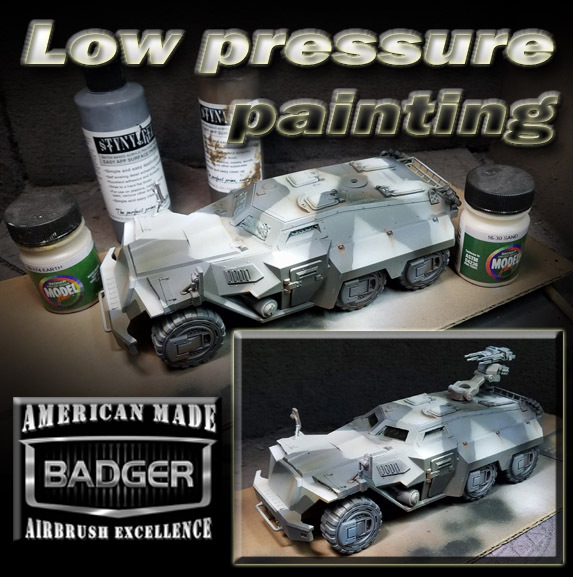 This had to do with painting a bit more with the airbrush, more specifically at far lower air pressures than I had used! Long ago, when I last used an airbrush for painting, I was working with an external needle Pasche which required very high PSI in order to make the mechanism spin up. I got pretty used to this higher air pressure, and continued to do so when I used the Patriot and Sotar brushes from Badger. This beast, however, would require a very different approach. The interior is what posed a major problem, along with the sheer size of the vehicle. 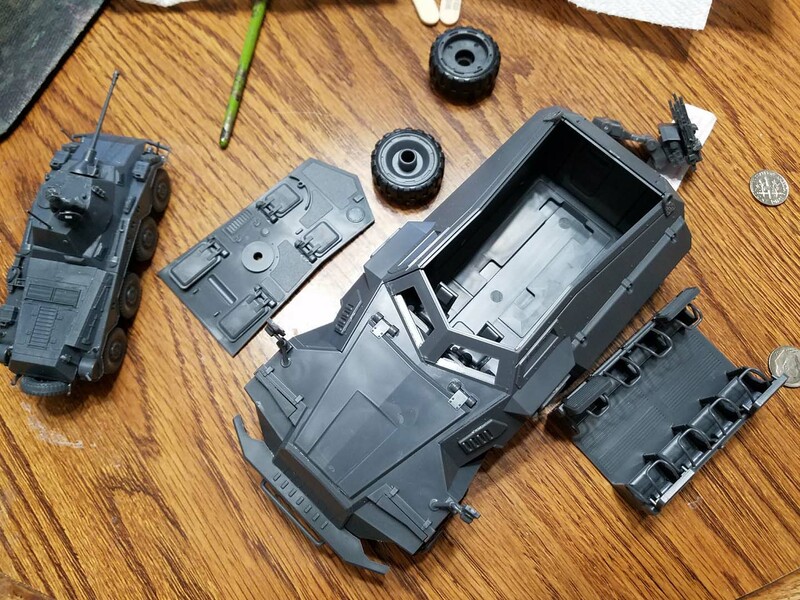 You could see very little of the interior via the hatches, so there was not point in wasting effort on doing lots of glazes and other standard techniques there. 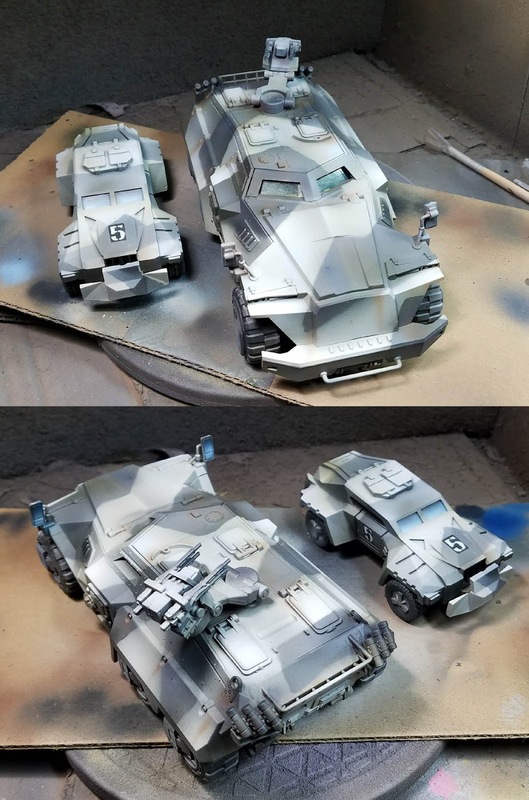 So, I had to figure out a way to maximize the airbrush phase to make it look more like I had done all those extra elements. Using a pressure about 1/3 the usual, I was able to get some significant shading and color variations... more like what I would normally do with my brushes, glazing, and so on. The Puma to the right was done at the same time, among several other items. I also did a LOT more masking than I had done on any other figures. Fortunately I have a large supply of blu tac! 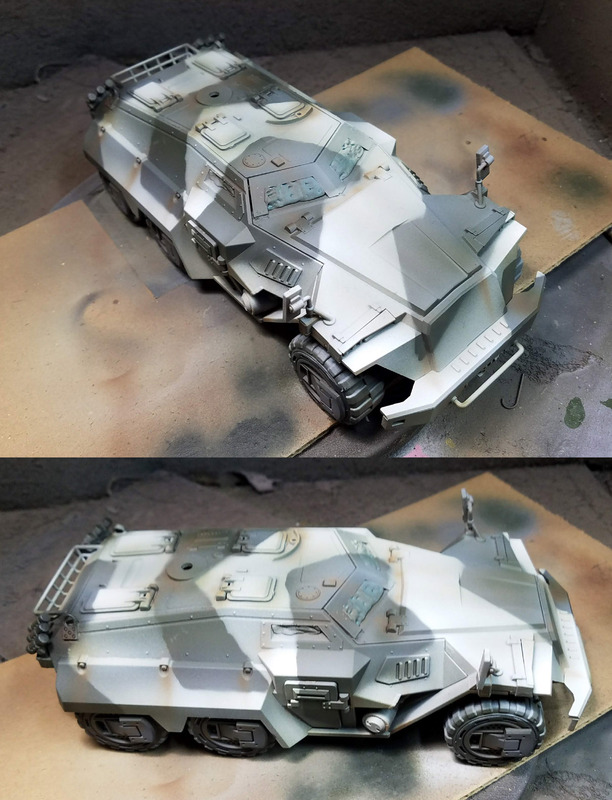 I was able to mask off this requested camo pattern, and manage to get a lot of shading built into it. Again, this had a lot to do with the extra effort of masking, and that very low air pressure. 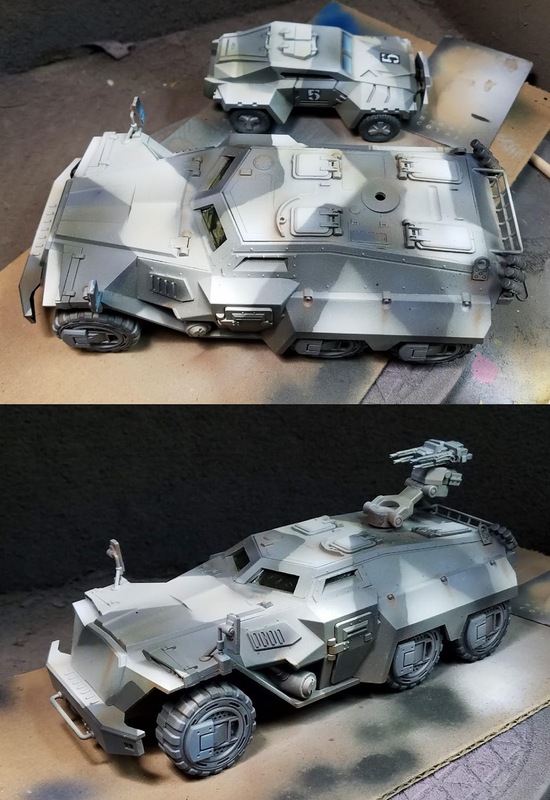 Once the masking was removed, I went back into the shadow areas to get some extra colors and tones, and even a bit of weathering. I was very pleased at how I could achieve something that was almost transparent at times, as if I was doing a standard glaze with my brushes! This was something I did all the time with my watercolors (specifically Dr. Martin's Dyes). 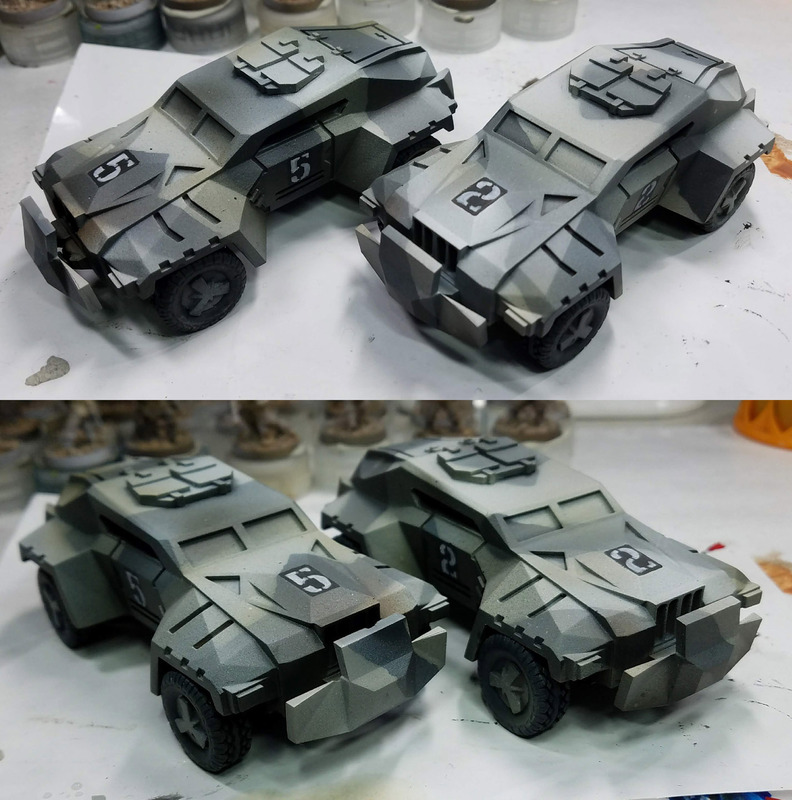 Now, the Badger Ghost Tints serve that purpose, and I mixed them in every so often to get a more translucent effect. As usual, most of the colors used were from the set of 12 primer colors from Badger, the beloved Stynlrez. 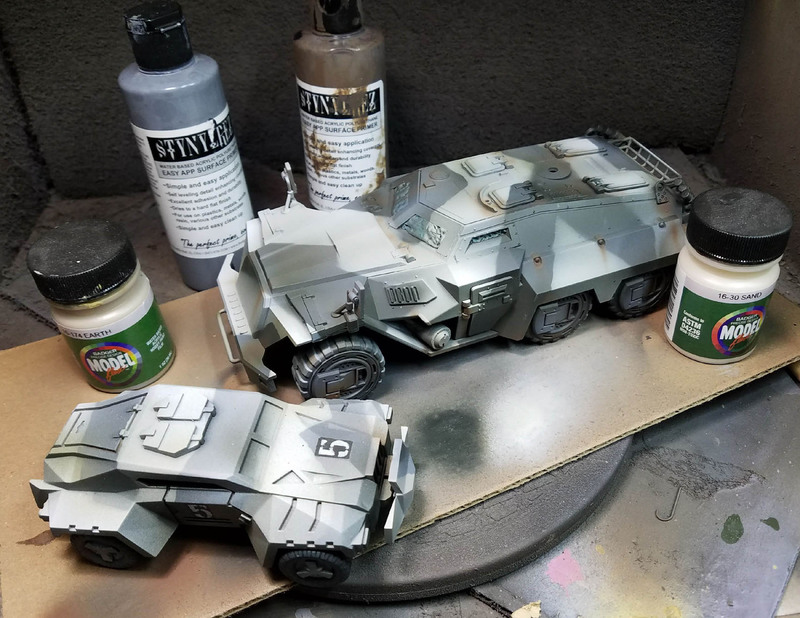 I also used a few of the paints that I first used on some terrain a few months ago. Those colors also have some nice depth. Most of the camo patterns were painted with those. 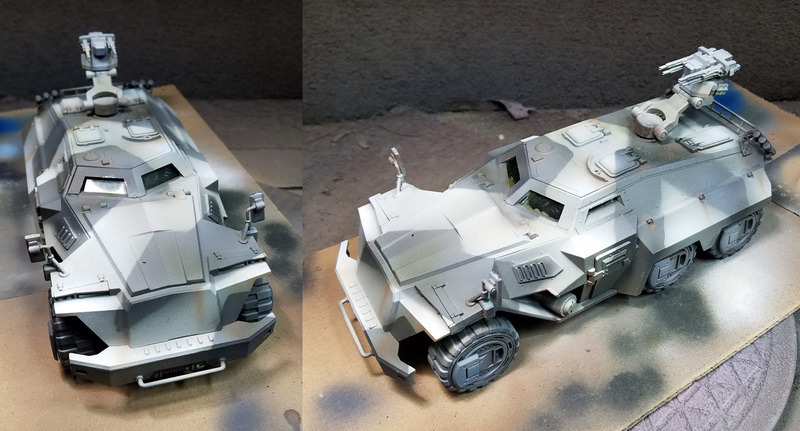 I will still be doing a significant amount of work with my regular brushes, but the weathering is supposed to be quite minimal, so you won't see a lot of chipping, rust or mud effects this time! 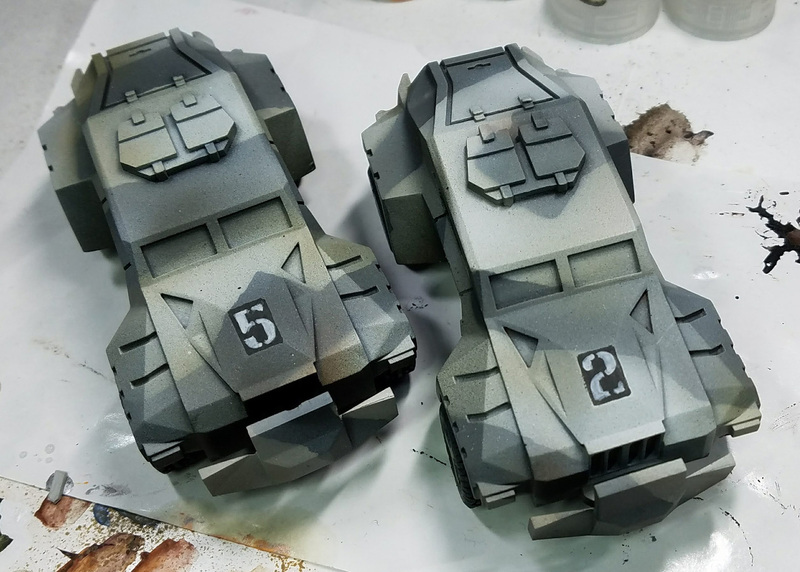 The other thing I noticed about the lower PSI is that everything was much more quiet, and the spread of paint particles was not quite as broad as I am used to with the more violent priming process. So, this makes it more likely that I could do some sort of Facebook live or other kind of painting session with the airbrushes in the future. Stay tuned, because you never know what might happen!